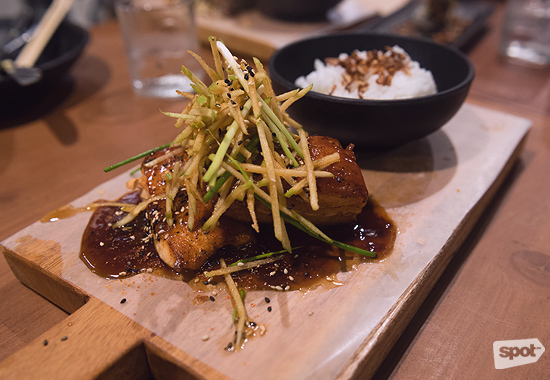 It's a fuss-free restaurant with surprisingly explosive modern Asian cuisine. 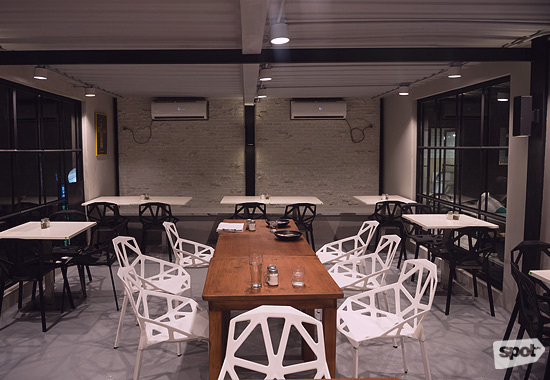 (SPOT.ph) Unit 16 on United Street is fast becoming the newest Pasig place-to-be. Up until this year, the building was quickly dismissed as just Nav or Uncle Moe's or the quieter but still popular Longganisa Sorpresa—Kapitolyo long-timers—but walk through a narrow, decrepit hallway (the same one that leads to the communal restroom) and apparently there's an entire community of restaurants (introduced on the facade in tiny little signs), all ready to compete for your appetite. 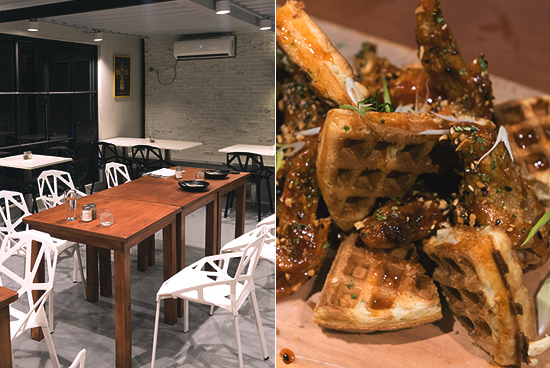 There is, of course, social media revelation Taco Vengo, whose Chwaffles and sous-vide eggs-laden nachos still have tongues wagging; Anu'Man, the LGBT-friendly space with a no-judgment policy and a dish called Ang Pinakamakisig na Sisig sa Balat ng Lupa; a ruckus of wood and concrete for a yet-to-be-completed resto-bar. Unit 16 surprisingly yields a lot of room. At the end of a clandestine stairwell, you'll find more construction going on for a health shack, and finally, No Reservations. You can rent the space, too. The name is no giveaway and the bare, white brick-walled space doesn't let on much either. As if to contrast, the tiny kitchen is where Chef Jay Angeles prepares to throw big bombs of flavor. The menu is unpredictably Asian in theme and refreshingly small—enough that when you come with a big group, you can probably enjoy every dish, and maybe even seconds. Customers can get an initial measure of No Reservations' culinary pursuits with the Grilled Corn (P175). 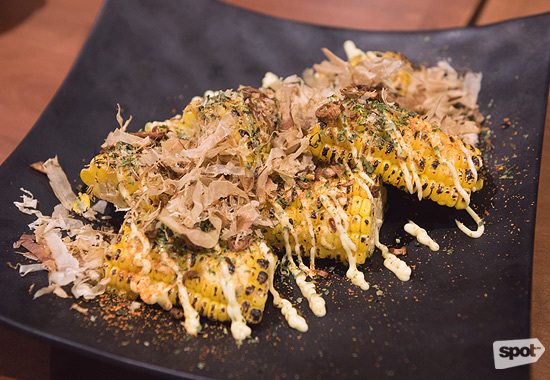 Buttery corn on the cob are dressed in bonito flakes, nori, and kewpie to detonate earthy little explosions with every juicy bite. Seemingly extraneous details, such as the light-handed sprinkle of togarashi, create those nuanced shades of extra flavor. The Tempura of Oysters (P265) is a dual treat of oyster and oyster mushrooms, all donning a thin, crisp coat. 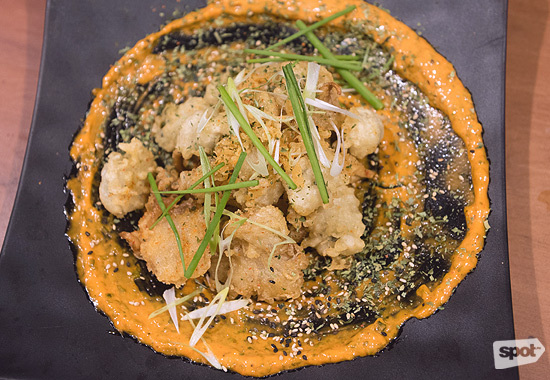 It's a must to be liberal with the gochu mayo, a clever play on gochujang, to appreciate the grand effect of heat and brine. The House Roll (P245) is where Chef Jay exercises his creativity on a regular basis. It changes often, depending on what's available, like a keep-you-on-your-toes affair that has you always looking forward to your next encounter. 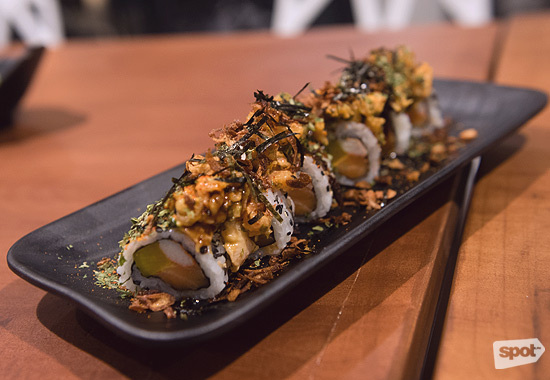 The day we went, the House Roll came with soft rice, kani, and salmon juxtaposed with the crunchy pickled radish—a collision of contrasts that made for such a tasty jumble. Garlic flakes are uncharacteristic features in sushi, but quite a nice welcome in flavor. 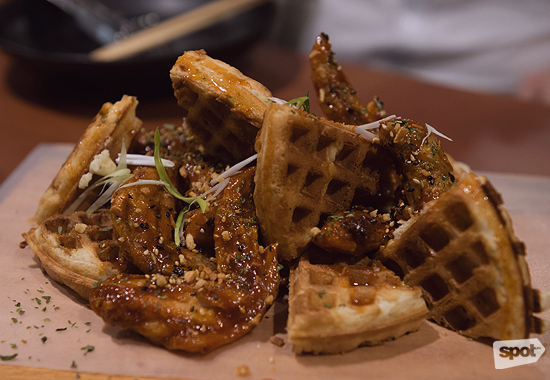 Cultures cross in the Seoul Style Wings and Waffle (P329), a classic American dish that's been treated to some Asian standards. We have to talk about those waffles. They're sliced into triangles, each one perfectly cooked to airy and crisp bites. The batter is so smooth that you don't get any of those random, unappetizing bumps that you often get in lackluster versions. To complement the sharp heat from the wings, Chef Jay blesses his grids with a tasty twist of spring onions. The bold, herbaceous kick is a compelling statement against other savory waffles out there. 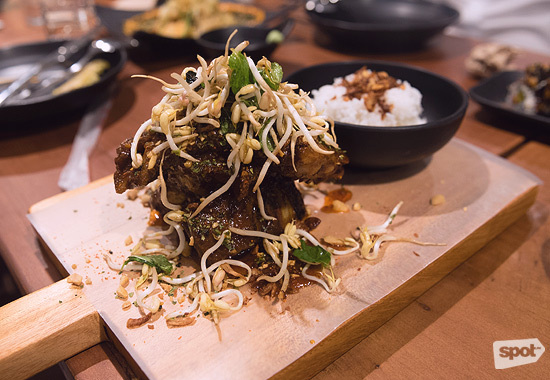 The Thai-style ribs (P349) are cooked twice to really ensure that they slide off the bone with minimal effort. Sweet and spicy glazes work so well with pork that you see a variation of that profile often enough, but it's the addition of peanuts and bean sprouts that set it apart. It's not a dish that holds back and the garlic rice offsets the intensity nicely. No Reservations' fish takes you on a lighter path. It's salmon (P409): a bale of crispy apple sticks painted with teriyaki sauce sets up a tart and sweet base for that earthy pink fish. The final flavors are uncomplicated and easily relatable. 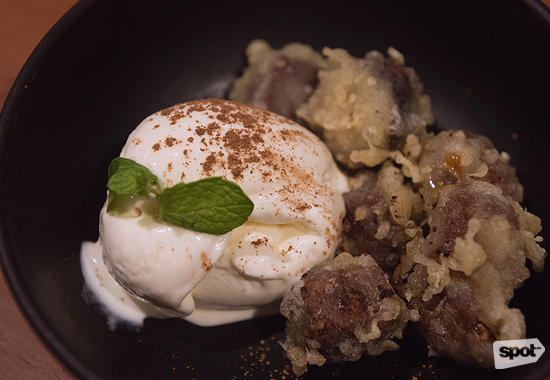 There are only two desserts—for now—and both are reinforced by the creamiest ice cream that Chef Jay refuses to divulge. 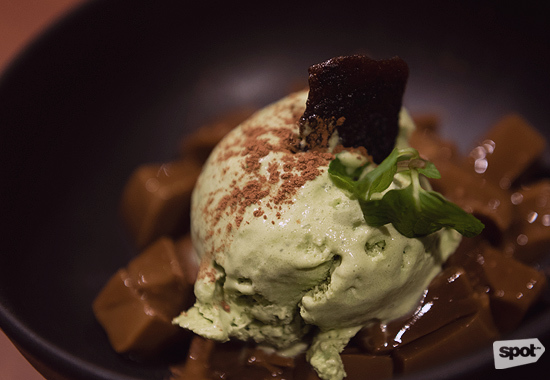 Tea and coffee join forces in a stunningly brazen bowl: Vietnamese coffee jelly cubes are topped with sweet matcha ice cream. It's for those who like to get hit square in the face with flavor. Sweeter promises are in store in the Chocolate Bar Tempura (P199). Supermarket chocolate like Mars Bars and Three Musketeers are sliced into nuggets and sinfully fried. The side of ice cream is more milky than sweet, evening out the sweetness from the candy. Come night time, No Reservations shifts from plates of ice cream and waffles to bottles of Brew Kettle. There are bigger ambitions to improve the bar and make a few other tweaks here and there. 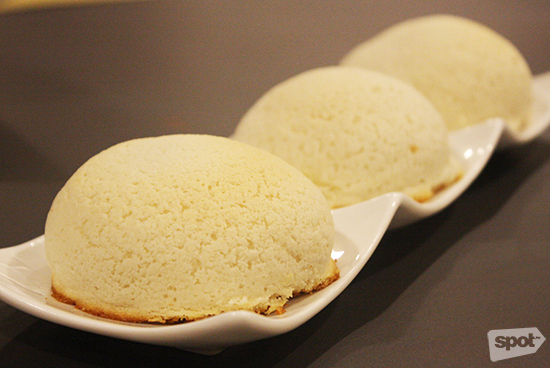 Co-owner John Carl Ang tells us that the restaurant's name also entails having no inhibitions. However you interpret that, we like that they don't have any reservations when it comes to flavor. 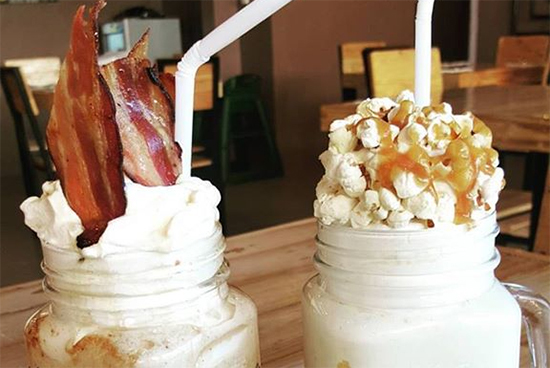 Look who's making their own bacon milkshakes!